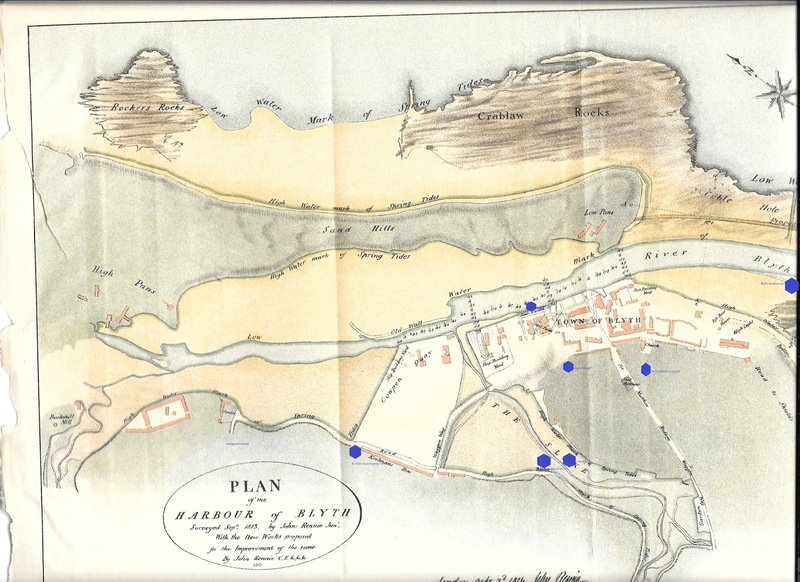 This plan of Blyth was made in 1813 by John Rennie, later to be Sir John Rennie. He was an eminent engineer and authority on harbour works. He was the designer of the breakwater at Plymouth Harbour and Waterloo Bridge across the Thames. 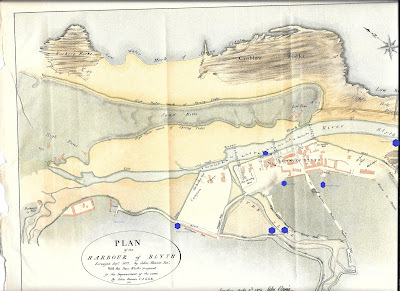 The plan shows Rennie's proposals for the improvement of the harbour at Blyth. These included the construction of a pier, or breakwater, 1370 yards long on the seaward side to prevent waves crashing over the rocks, which were swept into the channel blocking it up. It would also help guide ships away from the dangerous rocks and into the harbour. It was also part of the plan to build jetties on the westward side of the harbour to break up the waves and tide action which would help prevent silting of the channel. Lastly he proposed that a new, straighter and deeper channel be cut. All this work would be very expensive, of course. So was the survey. Rennie had been commissioned to survey the harbour by the landholder of Blyth Sir Matthew White Ridley. 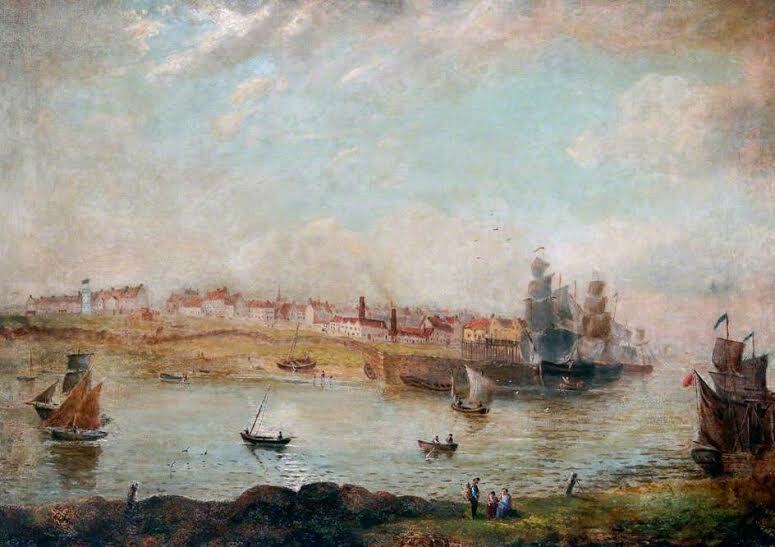 Ridley had "come of age" in 1799 and could see the potential of improvements to the harbour now that the coal trade was expanding with the creation, in 1794, of a deep-mine pit at Cowpen. The coal was shipped via the River Blyth as was his own coal from the Plessey mines some five-and-a-half miles away. Ridley had also sought the expert opinion of some master mariners from Lynn on the best way to alleviate problems that occurred within the harbour. 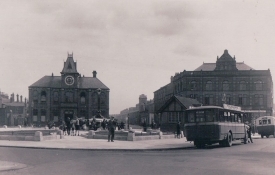 Lynn, on the East coast of England, was the principal trading port with Blyth at this time. The proposals put forward by Rennie were not adopted immediately. But in a letter to the Admiralty, responding to charges he had damaged the harbour, Sir MW Ridley claimed he had spent £956 (roughly £60,000 in 2015) clearing and deepening the river mouth between Jack in the Basket and the Bar. He had also constructed a small stone dyke, or breakwater. Pilots and shipowners also came to Ridley's defence and were grateful for the improvements made but mentioned in their letter: "We fear the improvement projected by him [Rennie] cannot be done but by pubic means". In other words it was un-affordable to Ridley as a private investor at that time. "During the remainder of the eighteenth century the Ridleys practically controlled the coal trade at Blyth. They had secured the whole of the collieries in the Plessey district, where they worked the Low Main seam, then known as the 'Plessey Main coal,' and were owners of the only shipping quay at Blyth. Although the small amount of foreign trade which had existed during the early part of the century dwindled away after 1743 in consequence of the increase in the export duties, the coasting trade continued to afford a steady market for the output of the pits. But the closing years of the century brought with them the prospect of competition in the trade. 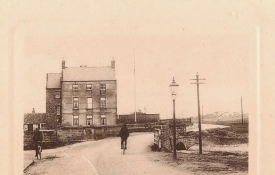 It began by the opening of a small colliery in the neighbourhood of Bedlington, the proprietors of which, Messrs. Gatty and Waller, secured from the bishop of Durham a quay on the north side of the river near the site of the present Cambois staiths. Gatty and Waller's colliery, however, proved a failure, and the quay was bought up by Sir Matthew White Ridley, who also acquired the colliery and removed the pumping engine to Plessey, where his mines, then carried to a depth of forty-six fathoms, were hard pressed by water. In 1793 further opposition took place with the commencement of a colliery on the adjoining estate of Cowpen, the property of the Bowes family, then represented by Margaret Wanley-Bowes, Thomas Thoroton and Anne his wife, and the Rev. Robert Croft and his wife Elizabeth. In 1782 a borehole had been put down on the estate proving the existence of the Low Main seam, or Plessey Main coal, at a depth of ninety-two fathoms from the surface. To win this seam so far in advance of the pits then working at Plessey and at such a greatly increased depth was a considerable undertaking and one which the lessors were in 1792 advised must be 'attended with uncertainty, great difficulty and much expense.' No doubt, however, the prospect of so ready a mode of disposing of its produce as was offered by the river, and the large area of coal which a colliery at Cowpen would command, must have been a great temptation to anyone who had turned his thoughts towards such a venture, and, in spite of the prospective difficulties, a winning was commenced in 1794. The adventurers were Martin Morrison of Whitehouse, in the county of Durham, Stephen Croft of Stillington near York, John Clark (already interested in rope-making and shipping at Blyth), William Row, a Newcastle merchant, Aubone Surtees and John Surtees of the same town,' the scene of their operations being at the ' A ' pit, near the present colliery office, which was built at the same time. With the winning of Cowpen the period of deep mining in the Blyth district may be said to have commenced, and, as it is by far the oldest of the collieries now working in the district, having at the present date been in continuous operation for upwards of 110 years, some details of its early struggles may be of interest. By the beginning of 1795 good progress had been made at Cowpen, the upper seams had been reached and the pit was being pushed on to the Low Main, which was opened out and ready to commence work by May, 1797, the shaft being fitted with a pumping engine and two 'machines' or winding machines for drawing coal from the Yard and Low Main seams respectively. 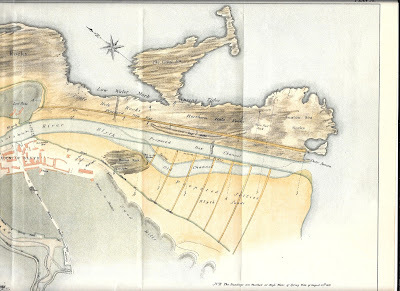 The colliery was connected by a wagonway with a shipping place on the river at the ' Flanker,' or mouth of the tidal area, called the 'Gut,' which extended inland as far as Crofton and formed the eastern boundary of Cowpen township. It was not an unusual practice at this period for colliery lessees to let the working and leading of the coal to contractors, who found all labour and stores and were paid at a fixed rate on the coal delivered at the staith. The colliery commenced regular work on this principle, the first 'under-takers,' as they were termed, being John Clark, one of the lessees, and three coal viewers, John Gray of Newcastle, Richard Hodgson of Plessey, and Richard Smith of Shotton, the two last named bringing mining experience gained in the Plessey district to the assistance of the partnership, which was dissolved four years afterwards the working of the colliery being subsequently carried on by the lessees themselves. In its early days the colliery seems to have been beset by difficulties. A market for its produce had to be secured in spite of the opposition of the long-established Plessev collieries with their more conveniently situated place of shipment and, as the Blyth trade was then a limited one and mainly confined to the coast ports, the London market for this class of coal with its higher prices being to a very large degree in the hands of the Hartley colliery owners, the output which it was possible to secure for Cowpen must have been quite incommensurate with the standing charges of so deep a winning. Like the deeper collieries of the Tyne basin, it had also to face mining difficulties caused by want of experience in methods of working coal at increased depths, and by ventilating appliances which were inadequate for the more extended areas attached to each of the deeper shafts. It was found necessary, therefore, as early as 1799 to prepare for the expenditure of fresh capital in sinking the ' B ' or North pit to win the Low Main near the river at a depth of 109 fathoms. This task was completed and the pit got to work in 1804, a branch line connecting it with the wagonway from the ' A ' pit to the Flanker. Operations were now chiefly confined to the ' B ' pit Low Main and, after the termination of the expenditure on it and the staiths, matters went on more smoothly for a time, although the yearly output was only about 48,000 tons, until about 1812, when the occurrence of a creep in the ' A ' pit old workings caused great anxiety and expense. The ill-success of the enterprise soon led to changes in the ownership, resulting, about 1811, in Mr. Taylor Winship becoming a partner and assuming the direction of affairs. Shortly afterwards overtures were made to Sir Matthew White Ridley with a view to putting an end to the competition of the Plessey collieries. 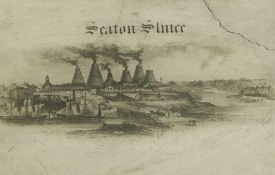 The whole of the trade from Blvth had for the six years previous to this averaged about 80,000 tons a year, and it was suggested that, as the Hartley [Seaton Sluice] owners were not likely to be able to increase their vend owing to the confined nature of their harbour, the closing of the Plessey pits would bring about a large addition to the Cowpen vend and result in an increase of profit greatly exceeding the cost of compensating Sir Matthew White Ridley for his withdrawal from the struggle. The fact that the Plessey pits, which had been in working for over 100 years as sea-sale collieries, had by this time largely exhausted their resources and that the expense of making fresh openings to the dip could hardly be warranted in the face of the Cowpen competition, must have greatly influenced Sir Matthew Ridley in consenting to these proposals. In August, 1813, the last of the Plessey pits, the 'View,' was laid in and the Cowpen owners were freed from serious competition in the Blyth trade. 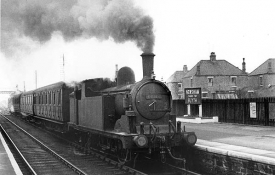 They were also able to secure the use of Sir Matthew's shipping quay at Blyth, which was at once connected with the ' A ' pit wagonway and thenceforward formed the shipping place for Cowpen. Trouble from the creep having shut off the coal to the south of the 'A' pit, the lessees were driven northwards, and in 1816 commenced working the Low Main to the 'B' pit under portions of the Cambois and East Sleekburn estates, of which they had secured leases respectively from Sir Matthew White Ridley and Mr. William Watson of North Seaton. Sir Matthew Ridley had, before 1817, secured an interest in the concern, and in 1820 held five of the nine shares into which the property was divided, the Rev. Robert Croft being proprietor of two and Mr. Taylor Winship of the remainder. Mr. Winship, some time prior to his death in 1822, seems to have parted with his interest to Sir Matthew, although he continued to act as the colliery agent, and by the beginning of 1823 Sir Matthew had acquired Mr. Croft's shares and become the sole owner of the colliery, which was then in by no means a prosperous state." The population of the town of Blyth in 1811 was slightly under 1,500. The Parson and White Trade directory of 1827 lists in this area: 2 watch and clock makers, 5 public houses, 5 tailors and drapers, 2 surgeons, 1 straw hat maker, 2 stone masons and builders, 1 iron monger, 2 rope and twine manufacturers, 3 milliner and dressmakers, 4 marine stores, 1 linen and woolen drapers, 3 joiner and cabinet makers, 1 ironmonger, 18 grocers, 5 bakers, 1 bookseller, 9 shoemakers, 1 boatbuilder, 2 block and mast maker, 2 braziers and tinners and 5 butchers. There were also 14 shipowners/masters listed but they lived in the newly-created, well-to-do suburb of Waterloo by this time.